The 24 week legal abortion limit has been in the news again, with a couple calling for a review after their daughter was born alive at the same stage of pregnancy. This issue is far more complex than how it has been reported. It is about more than the rights and wrongs of abortion and the legal limit. We need to look past the emotive headline to consider the reality of the challenges faced by babies born at 24 weeks. These challenges are rarely highlighted. Baby Adelaide tragically lived for just an hour. Her parents have shared the only photo of Adelaide taken while she was alive, which shows that she was a fully-formed baby. I send Adelaide’s parents my most sincere condolences. To lose a baby is devastating, and having also lost a baby who was born at 24 weeks I fully understand why they feel they way they do. It is difficult to look at the photo of Adelaide and not feel sadness at the thought of babies who look similar being aborted. Yes, it is possible for babies born at 24 weeks to survive. However, their survival requires much more than inserting a breathing tube and waiting for the baby to grow big enough to go home with their grateful parents, as such reports imply by omitting details of the challenges these babies face. If it were that simple, I would be bouncing my son Hugo on my knee, rather than writing this post. My son, Hugo was born at 24 weeks because of the rare, life-threatening complications preeclampsia and HELLP syndrome. I was fully aware my baby was only just over the legal abortion limit, and the threshold where he would receive treatment. We were told that our son had a 50/50 chance of surviving birth. If he was born alive, our baby was likely to suffer a brain bleed, have underdeveloped lungs, experience bowel problems and live a short, painful life. We were told that some parents of babies born at a similar gestation choose to have their baby placed on their chest to die, not wanting them to suffer. This was said without judgement: the choice was ours to make. My partner and I did not hesitate to say that we wanted our baby to be given every chance to survive, to fight, to come home with us. Our baby was very much wanted, conceived after two years of trying and a round of fertility treatment. We were fortunate that Hugo was born fighting, and that doctors were able to insert the line to help him breathe. We were also fortunate that Hugo avoided the brain and bowel problems. 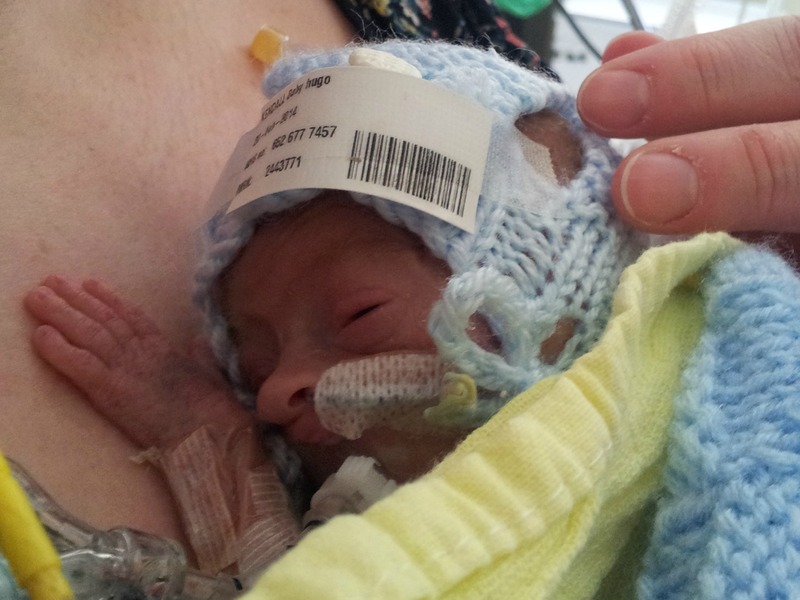 Lungs are the last organ babies develop, and sadly Hugo’s lungs were his main problem. Treatments were tried, and treatments failed. All options were exhausted. We were advised that it would be cruel for Hugo to remain on a ventilator with no hope of recovery, and cruel for us to live in false hope. Withdrawing treatment was recommended. It was news we didn’t want to hear, and a decision we did not want to be part of, but it was the right one. Hugo died peacefully in my arms, aged 35 days. We are heartbroken, but I am also grateful for the time we had with Hugo. Many babies born at such an early gestation do go home. However, problems relating to their premature delivery often result in a range of developmental delays, special educational needs and physical disabilities. These children are all precious, and I envy these parents their live children. 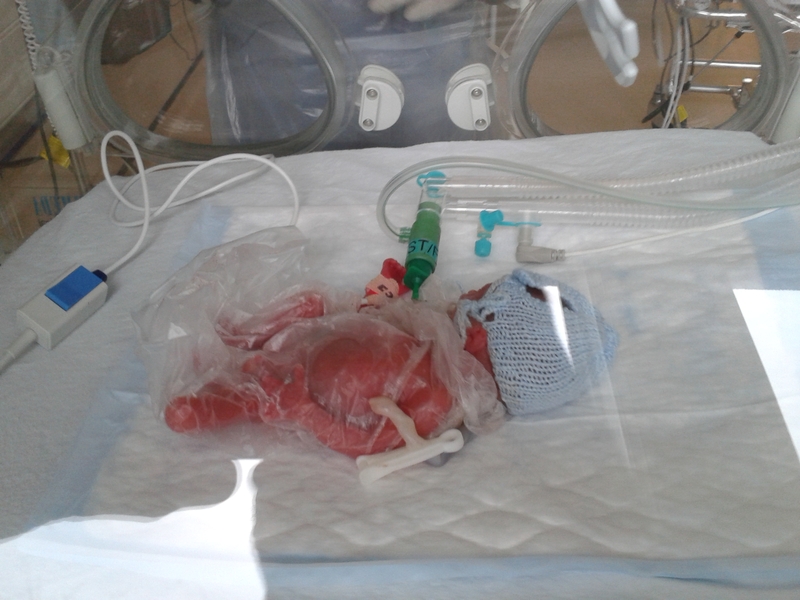 Any baby’s stay in a neonatal unit is fraught with the worst stress any parent can imagine. Even the parents who get to take their baby home are often faced with the possibility of having to make similar decisions to the one we had to make for Hugo. Parenting in a neonatal unit is an issue that does not receive enough focus. These parents need more support, especially those whose children have special needs. For the record, I always have been, and remain pro-choice. There will always be women who need access to an abortion, and it is better that it can be provided legally. It is worth bearing in mind that because abortions can be carried out until 24 weeks of pregnancy, it doesn’t mean that many are. In 2012, 90% of abortions were carried out before 12 weeks of pregnancy. Just 1% were carried out between 20 and 24 weeks. The reasons for the terminations are many and complex. Women have the right to decide what they do with their own bodies. Hugo was my first and only pregnancy to date; I have never been faced with such a decision. I would hope that for most women, the decision to terminate a pregnancy is not taken lightly. Being able to give babies born at 24 weeks’ gestation a fighting chance at survival is wonderful. But we must not imagine these babies’ survival is guaranteed, or straightforward – and always explore beyond the emotive headline. I am so sorry for your loss. I am so happy you got 35 days to hold and behold your son. I really wish you had more time together. Referring to the number of later terminations as “Just 1%” doesn’t really indiciate what an actually HUGE number it represents. Guttmacher Institute reports approximately 1.06 Million abortions occured in 2011 (I couldn’t find more recent statistics) with 1.9% occuring 18-20 weeks and 1.3% occuring 21+ weeks. If we just took the 21+ week percentage, that represents 13,780 abortions a year after 21 weeks. That is about 37 a day. That is “many” to me. That 1% is not “just 1%” it is a huge number of children, being terminated for possible severe fetal abnormalities as well as things like Down Syndrome, Cleft Lip, limb deformations, Club Foot, and even gender. So these children are being euthanised inutero for many reasons that they would not be allowed to be euthanised for after birth… had they been born with these conditions we would not allow them to be euthanised, but we allow it to happen for reasons like bodily autonomy and because they probably wouldn’t survive if they were born prematurely. It’s heart breaking to me because these kids would be great beautiful kids no matter what their apparent disability, but we strive for perfection and so we allow this. Very nice to see such a balanced and well-informed article on this emotive and difficult topic, one often covered too briefly and simply by the media. As someone born below the 24-week ‘viability threshold’ (by modern standards), I agree with previous comments that the concept of ‘viability’ covers far more than gestational age; even measures like weight, which may be a better indicator, still do not reflect the variability of individual situations and their mother-baby physiologies. Similarly, the vastly complex social, cultural and medical issues that surround potential reasons for abortion, let alone the setting of an abortion time limit, are individually variable and cannot be over-simplified or stereotyped as ‘right or wrong’. Despite an inherent aversion to the thought that I could have been legally aborted, I agree that the freedom to choose, informed by the largest possible number of options, is the fairest and most important thing; it is then in the reasoning behind making such extremely difficult decisions that the potential for debate lies. Such debate may be agonising and protracted, but it is undoubtedly necessary. I am not a parent and cannot pretend to understand what having to make such decisions feels like or means, but I feel sure that any parent who endured that process and makes a choice, whichever choice, does so solely out of love for their baby. Thank you for such a considered comment. It is such a complex and emotive issue, and I’m glad you appreciated it. How wonderful that you are doing so well after having been born before 24 weeks. It is equally wonderful that despite that, you too agree with the freedom to choose. I think you are right – the argument is so much more complex than right and wrong. It is far better to support, give advice and guidance to parents-to-be in such a challenging situation than judge them. I really appreciate what you’ve written here. This is such a sensitive topic, and you’ve spoken about it sensitively. The limit to terminate a pregnancy in my state in the US is 24 weeks (although this may be moving toward 20 weeks). When we received my son’s diagnosis of potentially lethal skeletal dysplasia, we were advised to schedule our follow-up scan, which was supposed to verify that Owen was lethally affected, at 19 weeks so we could have plenty of time to make that heartbreaking choice if we decided that’s what we needed to do. At 19 weeks, Owen was actually looking like he would have a good prognosis… it wasn’t until 23.5 weeks that our MFM doc told us he felt that he’d been too optimistic at 19 weeks and didn’t expect Owen to survive his birthday. It was a terrible disappointment. We chose to carry at that point, but I can see the validity in the other choice as well. You are right: these decisions are hardly ever made without careful thought and consideration. One of the things that made it so difficult for me to face termination at that gestation was that I’ve cared for babies who were rescusitated as early as 22 weeks. Independent of the outcome for those babies, they were definitely beautiful little humans. I couldn’t imagine terminating my pregnancy when I knew generally how much of a REAL BABY my son would look like. I have always been pro-choice and continue to be. It’s such a hard issue to struggle with because I don’t think any woman wants an abortion, it’s sometimes just the best of a handful of really crappy choices (for instance, in our situation: deliver the baby at 24 weeks to let him die or deliver him at term and let him die. What an impossible choice no mother should ever have to make!). We were able too sustain ourselves throughout my pregnancy with the knowledge that Owen’s death was not certain since his condition was so rare, but if we had been facing a 100% lethal condition, I’m not sure that we would have chosen to carry him. I’m sorry I’ve written a book! This was just a really good post. A really sensitive piece about a difficult subject. Viability is about more than gestational age, and I often find this is lost in a lot of discussions about it. As well as reaching the 24 week mark, a baby must also weigh over 500g to be considered ‘viable’. In our case, we had to wait until 30 weeks for our son to reach the ‘magic weight’. That was six long weeks of not knowing whether he would survive from one day to the next. I don’t know what would have happened if when he was born he was under 500g, as he wasn’t. But I suspect they would not have thrown the kitchen sink at him, which give us a few precious days with us. I do know the Consultant when he was delivered did say (before he was weighed) he doesn’t look over 500g, and we both knew that if he wasn’t, he wouldn’t be ‘viable’ . In the end he was (just). Viability (what an awful term) is a complex issue, and it isn’t the case that 24 weeks = viability. Clinicians and parents have to make difficult decisions in complex and emotionally wrought circumstances (and parents usually don’t have the long lead in time which we had to try and prepare ourselves for every eventuality). By the way, you simply can’t prepare yourself. As far as I am concerned the viability debate is separate from the abortion debate. We are usually talking about different babies. We are talking about very different circumstances. Isn’t it the case that abortions can be undertaken after 24 weeks in very specific sets of circumstances anyway? My experience is that clinicians will try and do everything they can if they believe there is a glimmer of hope. And clearly there are cases before 24 weeks where clinicians have believed there is a chance and have given treatment to those babies. None of us can see into the future, so we cannot know which premature babies will survive (at 30 weeks most babies survive, ours did not) but the clinicians are in the best position to make that judgement. You’re right, abortion and viability are separate issues, but I got a bit frustrated with stories suggesting babies at 24 weeks can survive – which of course they can – but not explaining any of the context around it. There really is so much more to viability than gestation. 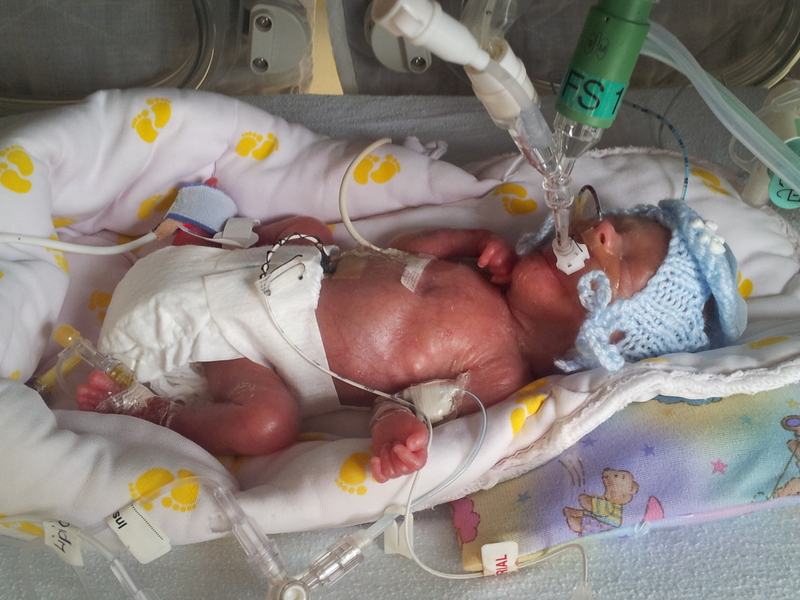 Hugo weighed just 420 grams at birth, whereas another baby in his nursery was born at 23 weeks, weighing 600 or so grams. That baby is now home and as far as I am aware doing well. This issue is so complex and emotive, with so much to consider. Every situation is unique and of course clinicians will recommend the best course of action for each baby. I’ve really only scratched the surface of it with this post. Thank you Leigh for this beautiful post. It is a complicated topic and a hard one to tackle once one has faced the devastating loss of a wanted baby. You did it beautifully. Like you say, such a very emotive subject. Having just recently viewed the (possibly viral) video clip of a baby developing in the womb from conception to birth on Facebook, it would make it so much harder to make such a decision, given the complexity of circumstances for individual cases, like you say. And what a decision to have to make. this is a fascinating topic and a hard one to handle one to tackle- you’ve written about it well, with little judgement. But the real conundrum of resuscitating at 22 weeks is that abortion is legal til 24. I’m pro choice as well, but I have trouble reconciling these two pieces of information. I understand terminating pre-viable and I understand terminating for fatal diagnoses, but right now our laws and medical ethics dont match up. so sorry to hijack your comments section! you just wrote a really thought provoking post.